Exhibition: Tate Britain Patrick Caulfield Until Sunday 1 September 2013 Tate Britain presents a survey exhibition of the celebrated British painter, Patrick Caulfield. Exhibition: Tate Britain Gary Hume Until Sunday 1 September 2013Part of the internationally celebrated group of ‘Young British Artists’ that studied at London’s Goldsmiths College in the late 1980s. If you feel like resting your work-weary eyes on big, retina-stretching canvases over the next 7 days, head to Tate Britain. The work of these two artists is being shown in parallel. Patrick Caulfield (mid-1960s generation) illustrates London’s 1960s good life in all its 1960s glory and Gary Hume (1980s generation) shows colourful, graphically novel modifications of the familiar. shirts along with a 1000 books and postcards. For Caulfield, all you need do is walk into room 1 and a painting will come up and grip you by the senses. There in all its primary coloured glory is the fabulous Santa Margherita Ligure (1964), lent from a private collector, a huge (1219 x 2438 mm) landscape depiction of Mediterranean gorgeousness. The 1960s may have had wireless, but they were not cordless. I love how Caulfield meticulously adds the cord leading to the plug on the wall with every lamp he paints. And we all recognize these 1960’s images: the portable typewriter (with eye-popping red ribbon), the rotary phone, the theatre bar, the tandoori restaurant, the iconic ‘stereophonic record player’ – whether they were our own, or belonged to older (or richer) friends, siblings or parents. It’s a catalogue of the times, a narrative. 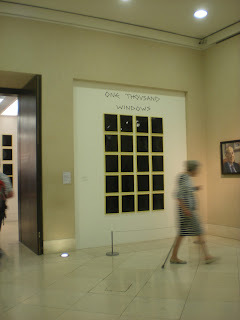 To have some idea of the impact of Caulfield overall, check out Tate Britain’s Art & Artists page before you go. And if you must take a peak at the marvellous Santa Margherita Ligure, here is an image courtesy of the online Art, Culture and History Library Bridgeman Art.